I’ve been using the GOTEK drive for a while now with two of my Amiga’s and, well, they work but I’m not really happy with the loader that Hervé created. I have nothing against him and I respect the enormous work he has done so far. The GOTEK is still a cheap and good choice for people that want to take a step away from the mechanical 3.5″ to a USB based version. The problem that I had with Hervé’s loader (which is the application that assigns .ADF imgaes to a slot in the GOTEK) was that many times I had to redo the slot assignment on images twice or more. A small thing, but still very annoying. 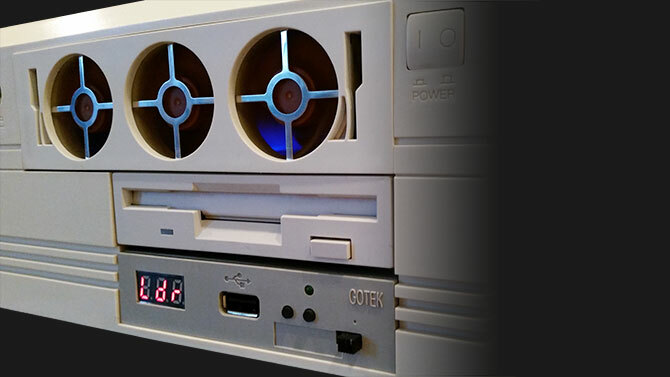 Later in 2015, the creator of HxC released a version of it’s famous firmware for GOTEK. The downside for many people is that they charge €10/unit while Hervé’s version is free. After I’ve red the specification I decided to try it on one of my GOTEK units. The registration was very simple. I sent a mail to the the given mail address and after about 15 minutes I got instruction on how to pay for the firmware via PayPal. When I the payment was sent it took around the same time before I got instructions and codes mailed to me. Since this upgrade does not use the standard STM tool for upgrade you need a code to download it and the server keeps track on how many devices you upgrade. When you have upgraded one unit you easily upgrade it via USB, so no more hassle with the USB-to-Serial dongle. The tool itself is VERY easy. 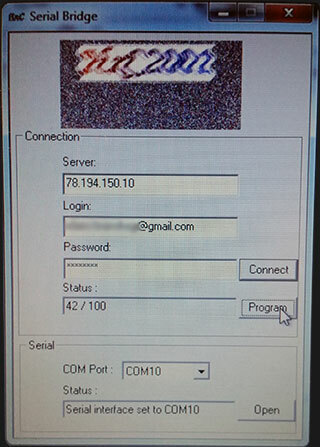 You simply fill in the address to the server, login and the password that was sent to you through mail and then click “Connect” followed by “Program” when the device is connected to the computer. When the upgrade procedure was finished, I disconnected my GOTEK unit and connected it to my Amiga 1200 and on the first boot it was set in a Ldr-state, waitng for a USB with a .upd file on it. I hurried to format a compatible USB-stick as FAT32 and then put the latest .upd file on it and then inserted it into my GOTEK while my Amiga 1200 was turned off. With excitement, I started my Amiga again. The update was very smooth and it showed very clearly when it was done. Now it was time to test the new loader. The procedure was exactly the same as with Hervé’s version. A loader had to be placed in the root of an USB-stick included with some .adf images. At first sight I must say that much more thoughts has been put into this loader. More features and it as not the “selection” bug that I experienced before. 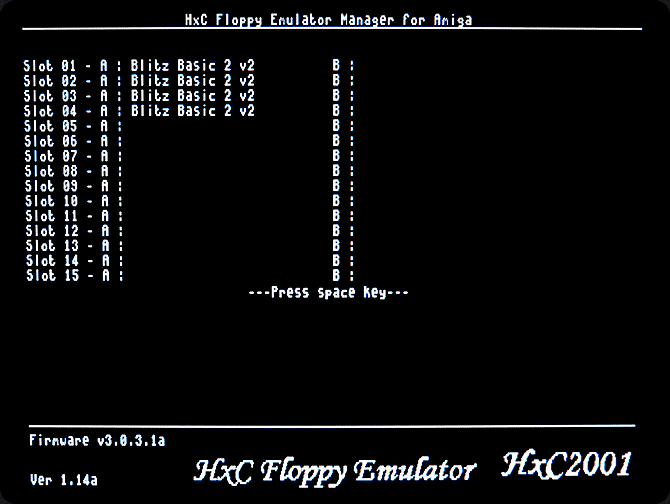 The menu is simple and has several screens that be seen below. This is the screen that is show first. You can see all the files on the USB-stick and also some information regarding actual image in the bottom of the page. This menu is where you can assign .adf-images to a slot on your GOTEK. This is done with your keyboard. 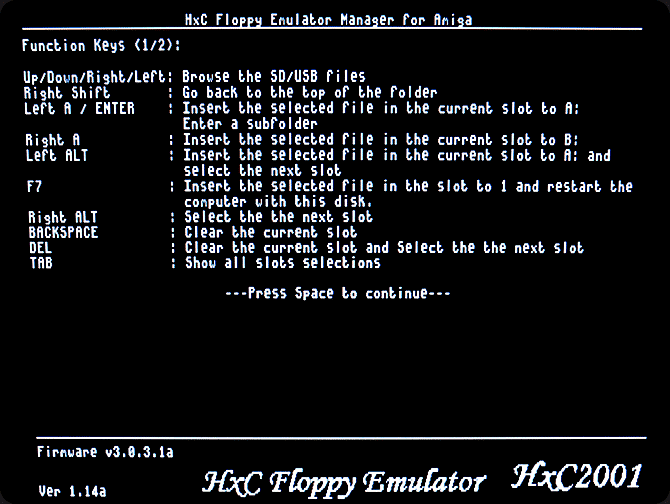 This menu helps you with the main control of HxC, images and slots. This menu shows how to search, save and to do some settings. After been playing with the new firmware from HxC for a while I decided to also flash my GOTEK that is in my Amiga 4000. The cost of €10/pcs is cheap and if you think of how much you spend on your hobby today, that amount is a needle in a heystack.